I carry a cooler with me nearly ever time I go out for a day on the lake, whether for fishing, or just out enjoying the scenery and getting exercise. I normally use a small cooler generally referred to as a personal cooler. When I go for overnight trips I use a 20 qt. cooler. When on 2 night trips and more, I have wished for something with a little more capacity. Enter the CreekKooler. First off, it has a 30 qt. capacity. But that’s only the beginning. 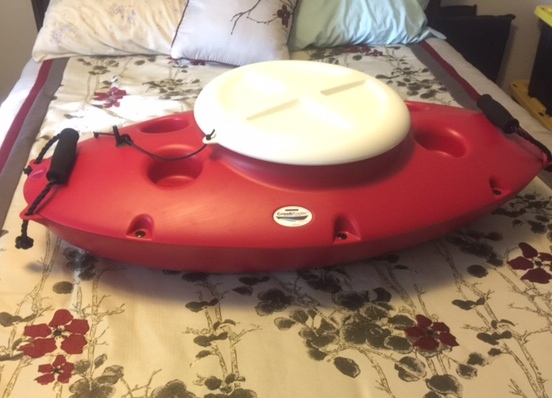 This cooler is designed to be towed instead of carried inside the kayak or canoe. I have a canoe, a SOT and another kayak (Jackson Kilroy) that easily hold any cooler (within reason) I want to carry. But I also have a touring kayak and never was able to carry a cooler with me. However, even with my kayaks that have room for a cooler, having one onboard means less room for other things so I could see using it with those too. While the CreekKooler appears to be marketed for water use it can be used anywhere a cooler this size would work. However, with a rounded off bottom it won’t sit as securely in the bed of a truck or trunk/hatch of a car as a traditional flat bottom cooler would. But on the other hand, it will match the contours of a canoe bottom much better than a regular cooler. Besides hauling drinks or food, I see one other possible application. 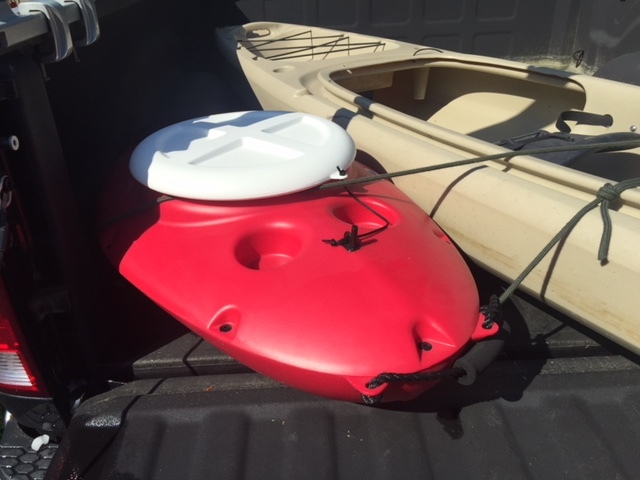 Many kayak fisherman use soft or hard sided coolers for keeping their catch fresh. Of course this would mean it needs a good cleaning after such use, fortunately, the CreekKooler can be washed very easily. Under care and maintenance the website recommends cleaning with mild dish detergent. For more industrial cleaning it can be cleaned with a car wash sprayer or using a water/bleach mixture (6:1 ratio). The CreekKooler is available in red, white, blue and cream. The lid is white regardless of the color of the cooler but there are a couple of custom lids available. One is camo and the other choice is a pattern that uses many small American flags. Speaking of flags, the lid is secured to the cooler with a small rope that connects to the cooler at what can also serve as a flag holder. The only limitation being the flag shaft must be 3/16 ” or smaller. The lid is easy to remove with just a 1/8 turn and with a rope permanently attached it won’t get lost or float away in current. The CreekKooler features 4 drinking cup holders, a pair on either side of the lid (bow and stern). There are also rope carry handles at each end but they are covered with soft and generously sized foam. Holding the empty cooler was certainly easy but the padding will be more important as weigh is added. When full I’d imagine a 2 man carry would be better but the cooler can be easily dragged according to the website. The cooler comes with a 1 year warranty. I haven’t had a chance to try out the CreekKooler but I do have a few concerns. I don’t think I’ll have any problem using it on the lake but I like to fish a small local river that has some rather strong currents. I’m not sure how towing the cooler will effect my limited kayaking ability. It’s hard enough paddling upstream and then I have to line up just right to make a few of the tight twist and turns coming back downstream. But that’s why we test gear, to find out how it performs in the real world. I received my CreekKooler in the summer of 2017 but a slew of unforeseen circumstances prevented me from testing it right away. The good thing is, I left it open in my gear room and by the time I got around to using it the strong smell I noticed when I first got it was completely gone. Anyways, I finally got a chance to put it to use, but first I’ll add the specs I left out in my initial report. I should first mention, I went on couple of kayaking trips last summer but I was paddling with speed demons in 17 ft racing kayaks and even a couple of surf skis. Not exactly ideal conditions to test a tow behind cooler. Then winter snuck up on me so alas, the CreekKooler remained unused. I patiently waited for the lake to warm up enough for safe paddling and the past few weeks have been obliging. It was 74 as I loaded my kayak and the CreekKooler into the bed of my pickup. 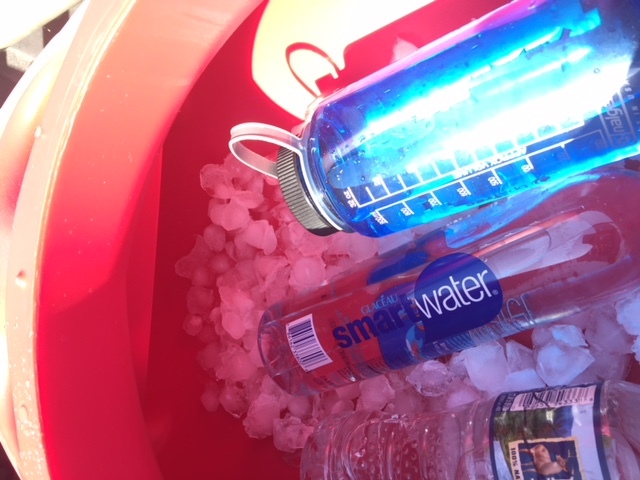 I emptied the ice maker from the kitchen fridge into the CreekKooler and added 3 bottles of water. The water was not hot but certainly not cold either, just straight out of my kitchen faucet. I estimate that I added about 5 lbs of ice so not much. Here is the results. 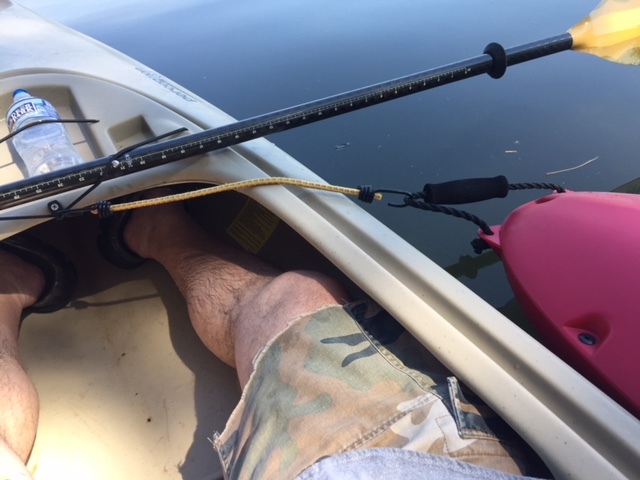 By the time I got to the lake it had warmed a few more degrees to 77 F. I unloaded and used the same rope I used tying everting into my truck bed as my toe rope. 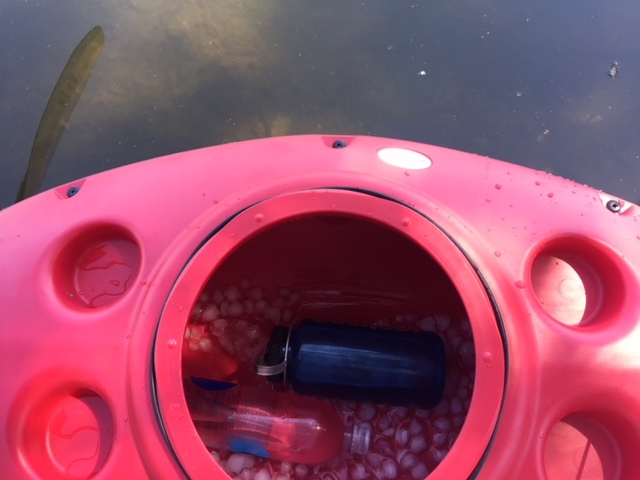 Since I was paddling solo and wanted to be able to retrieve a cold during without going ashore I just tied it off just long enough to pull the CreekKooler lid area right beside my kayak seat. Off I went like a gazelle, OK more like a turtle but that’s beside the point. What I’d do notice was that the CreekKooler was not hard to pull at all. It also tracked fairly straight but did very from side to side occasionally. After paddling about 30 minutes at a petty brisk pace I started getting thirsty. I had already noticed that when I stopped paddling it would turn sideways instead of gliding up beside me like I wanted it to so I had to paddle backwards to capture the CreekKooler. Once I pulled it along side me I had a little difficulty getting the lid off while keeping the CreekKooler from drifting away. 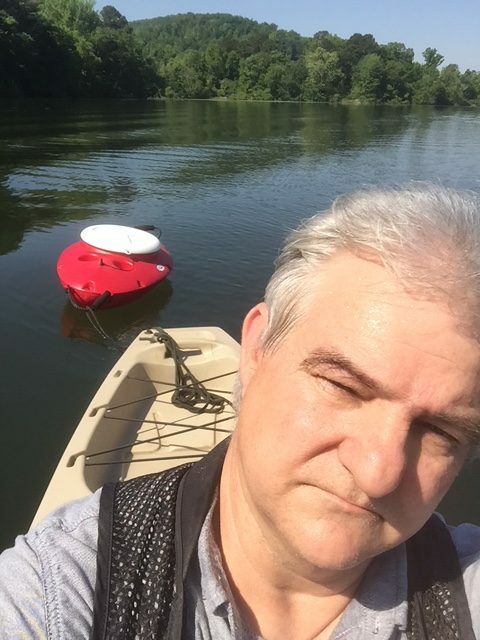 My immediate thought was I should have put a bungee cord in the kayak for this situation. I suspected I had one in my truck so after getting a drink I paddle back. Once at the bank I noticed I had the lid on slightly crooked. 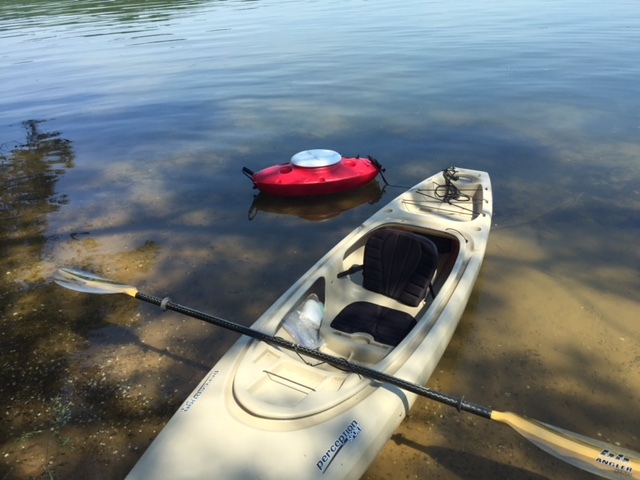 I repositioned it correctly and after retrieving the bungee cord I paddled abut 15 minutes and tried again. This time it worked much better. I could have used a shorter or stronger one to really snug it alongside me but I was able to manage getting the lid off much easier this time. I also got the lid on straight after a couple of misses so I need to work on that. Since this was my first paddle and my left shoulder was starting to hurt a little I decided to call it a day. By the time I got back to my truck it was 84 F. I loaded the CreekKooler behind my kayak this time so didn’t need to tie it in. Once I got home I looked inside the CreekKooler to see how much ice was left. It had melted quite a bit in just a little over 2 hours but I really didn’t have enough in to start with. I don’t drive by a store on my way to the lake and even if I did I’m too cheap to buy ice unless I really need too. Regardless, the 2 drinks I didn’t touch were ice cold. I took the time to see how they might fit in the molded in cup holders. Not too good…. the 32 oz Nalgene bottle was way to big and the tall skinny Smartwater bottle was way to skinny. Not that I would need the cup holder but some may need or use this feature. I’m guessing a 12 oz coke in a foam coozy would fit fairly snugly. So what are my thoughts after a brief test of the CreekKooler. It was easy to pull, I’m sure it slowed me a little but I didn’t feel like I was dragging anything heavy either. It is really overkill for a short paddle for holding a few drinks. I could see using it on an overnight paddle to a campsite. 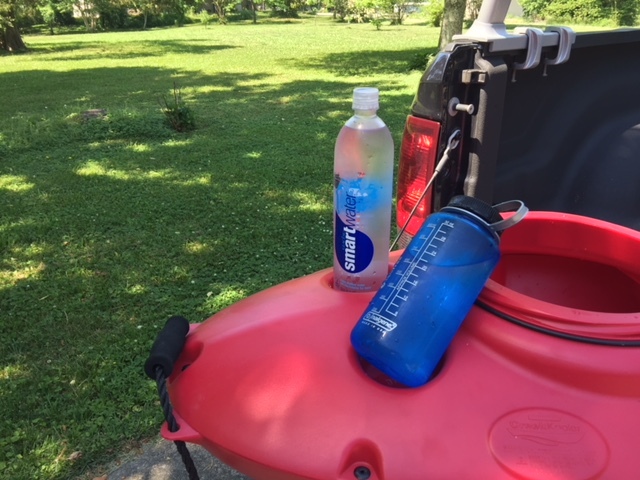 It would be especially handy for anyone with a small kayak or the type with hatches that would preclude carrying a cooler. It could also be handy on a group paddle as long as everyone either took turns pulling it or a strong paddler pulled it. That’s all for now. I will try to use it under more fitting conditions before rendering my last installment. Until then, happy paddling!